I have a confession to make. I am obsessive with keeping track of my bank balance. I don’t check it 30 times a day (more like once a week), but I do know how much money I have in the bank to the penny whenever I need to. I know this without having to login to my bank’s web site. Apparently, Bank of America knows that I don’t use their web site as often as they’d like. They sent me this email the other day. The subject was Can we help you with online banking? (which I really like). Access your accounts online. Check your available balances, view your transactions and transfer funds. Pay 10 bills in as little as 3 minutes with free, unlimited Online Bill Pay. Rest easy with our $0 Liability Online Banking Guarantee. You’re not responsible for any unauthorized activity on your accounts if you report it promptly. Take the Online Banking Test Drive to see how easy it is to manage your accounts and pay bills online. Or sign in today to get started. The email (which you can a screenshot of to the right) also had several side boxes assuring that the email was not a scam by listing by name, reminding me of how to sign in, telling me they can reset my password if needed, and so on. There was a clear link to contact Bank of America and another clear link to unsubscribe from the email. When used correctly, emails can be really useful (see this guest writer post). There is a fine line between useful and annoying and this email was useful. People spend quite a bit of time setting up their online banking and they might have forgotten about it. Or, they were unsure of what to do. Included their phone number right in the body of the email (as opposed to having a contact us link). Addressed the email in a Hi So and So format (instead of Prepared For). This makes it seem more personal and less like a form. Had it so a customer could just reply to the email instead of having to go to the contact us link to get help. 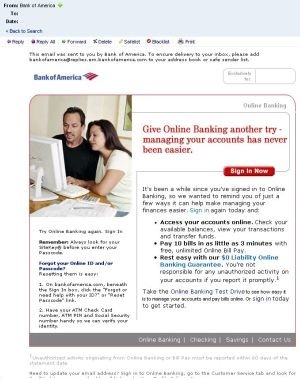 I could see how and 1 and 3 could possibly be a security issue (phishing is obviously a huge problem with online banking), so that might explain why Bank of America decided to not do that. Overall, the tone was friendly and helpful. It was a nicely designed and well written email that offered to help. Bank of America did a good job and I think everyone could take something from their email and apply it to their own. What do you think about this email? What other good emails have you received from companies? And Happy New Year! I’m looking forward to 2008. It’s always a good idea to be wary of emails that appear to be “official”, but yet could be phishing scams. Phishers are notorious for faking Paypal emails. Of course, you have to practice all the safe methods, such as never entering your PIN or password or SS# and so forth. Just some thoughts.